These Las Vegas hotels off Strip are just as fun as those located on the Strip! Whether you are looking for a quiet time away from the Strip, or just passing by Las Vegas, most of these hotels cater to all your needs. Other than being generally cheaper, many of these hotels offer something you can not find on the Strip - golfing, hiking, biking, horse riding opportunities, or great outdoor swimming pools. 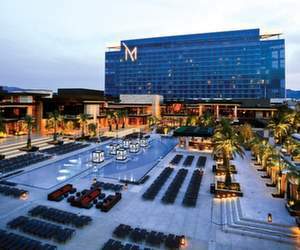 Review: The M Resort is a relatively small, chic off Strip Las Vegas hotel, located far from the Strip in Henderson and has only 390 rooms. The best part is that the hotel does not charge resort fee and you can enjoy all its amenities without paying extra. Being so far from the Strip, the resort offers a free shuttle service to other top Las Vegas hotels off Strip (the shuttle could run a bit more often). 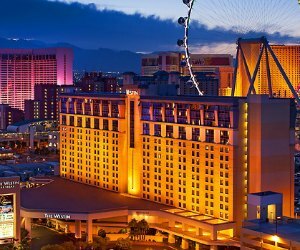 The M Resort offers some of the most incredible views from rooms overlooking the Strip! But you won't get too nostalgic with all the concerts and other entertainment events the hotel hosts all the time at their Ravello Lounge and Lobby Bar, Villaggio Del Sole Pool and chic Entertainment Piazza. The resort offers multiple dining options, including Anthony's Restaurant & Oyster Bar and Marinelli's restaurant offering Italian cuisine. The M Resort also offers a fitness room, spa and salon and a swimming pool with private cabanas. 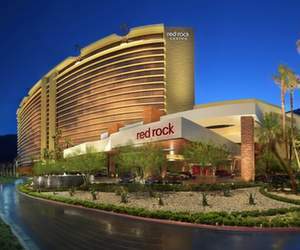 Review: Located near the Red Rock Canyon, the Red Rock Resort is an off Strip Las Vegas hotel lures tourists away from the Strip! While the resort is quickly becoming the new celebrity hot-spot, not many tourists mind being detached from the fun and glamour of the Strip. The resort is luxurious, has it's own casino with non-smoking areas, and offers two amazing views from the rooms - the view of the Strip located about 11 miles away and the view of the Red Rock Canyon. Please note that the hotel charges resort fee for using its amenities, so be sure to use them! It's distance from the Strip the Red Rock off Strip Las Vegas hotel compensates by multiple attractions such as 10 restaurants for any taste (with inexpensive food), movie theaters with 16 screens showing the latest block busters, a day care center, spa and nightclubs, great swimming pools with a sandy beach, spa and salon. The hotel often hosts popular live music concerts as well as many free concerts (and can get overbooked during this time). Review: Green Valley Ranch Resort and Spa is a beautiful, mid-size resort that looks like it could belong somewhere in Italy or Spain rather than Las Vegas, so we will call it's style "Mediterranean". If you are seeking peace and quiet, this is one of the best Las Vegas hotels off Strip, and quite affordable one. The hotel offers a free shuttle to the Strip, but the last departure is at 4:00 pm., so you are better off renting a car if you choose to stay here. Green Valley Ranch is located a just a short drive from Lake Mead and Hoover Dam, so it would be a pity to miss these attractions! Green Valley Ranch off Strip Las Vegas hotel has 9 affordable restaurants that cater to most tastes. The most raved about are Hank's Fine Steaks with mid-century decor, Terra Verde serving Italian dishes, Tides Oyster Bar offering delicious seafood, and Feast Buffet serving a variety of food. The award-winning spa offers multiple treatment choices, including facials and relaxing massages. The resort also has a nice relaxing pool with private cabanas, and, naturally, a casino that is more quiet than those on the Strip. In the evenings Green Valley Ranch offers multiple free and small-charge concerts, so you won't get bored staying at one of the best Las Vegas hotels off Strip! Review: When it comes to live music, nightlife, pool parties and entertainment off the Strip, Palms can only compare to Hard Rock Hotel (our next review). There is always something fun going on at all their four concert venues, however they host the best concerts at the Pearl Concert Theater. Palms Hotel is also famous for great nightclubs and pool parties. Fortunately, their hottest nightclub Moon as well as Ghostbar and the famous Palms Pool participate in the V Card program that can save you hundreds of dollars. In fact, Palms Hotel is so hot that we recommend it as the prime choice to host a bachelor party! Review: Hard Rock, is among the most "musical" Las Vegas hotels off Strip - much like Palms. However, hosting top rock, jazz and blues concerts in town isn't enough for them - they go as far as featuring musical memorabilia all over the place! From bustier belonging to Madonna to guitars to leather jackets - you can find something in every corner. Hard Rock is another great choice if you are wondering where to stay during Vegas bachelor party! As if that's not enough to keep music fans occupied, they have one of the hottest nightclubs in Vegas - Vanity, included in the V Card. Hard Rock Hotel also lures visitors with hot pool parties at their pools Nirvana (former Hard Rock Beach Club) and Rehab - also part of the V Card deal. Review: The Orleans Hotel is among the best family-friendly Las Vegas hotels off Strip. 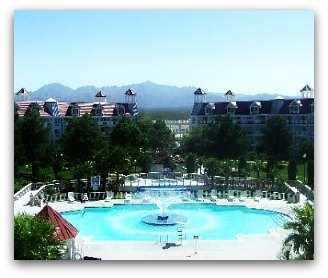 With 1885 rooms, it's actually a large resort that has it all - top entertainment, excellent restaurants, pool and spa. 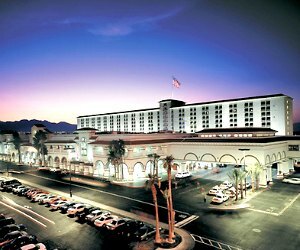 Although Orleans Hotel is located quite close to the Strip, you might never want to leave it! It offers so many things to do - there is a movie theater, bowling alley, 2 excellent venues that regularly host live music concerts and even occasionally sports events: Orleans Arena and Showroom. 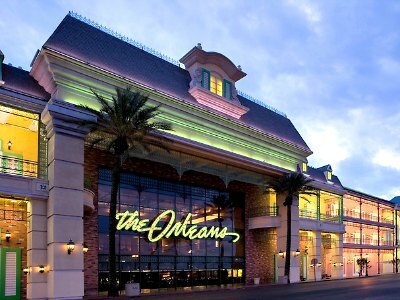 As for dining choices - The Orleans has 14 restaurants! Kids would have a lot of fun there too - Orleans Hotel offers an arcade with video games, and a play zone for little kids. Review: Rio is one of the hottest Las Vegas hotels off Strip - the atmosphere of party, beautifully appointed suites, and a few of the hottest shows in Vegas! Entertainment in Rio includes: Rat Pack is Back - a tribute group performing at the Crown theater, a magic show by Penn and Teller, a steamy all-male revue Chippendales and an absolutely free dancing show (that is a few shows per night) called Show in the Sky. Plus, they often host various live music bands. If that's not enough to convince you to stay at Rio, they have a hot swimming pool (entrance fee included in the V Card with a European area, and even pool side massages! 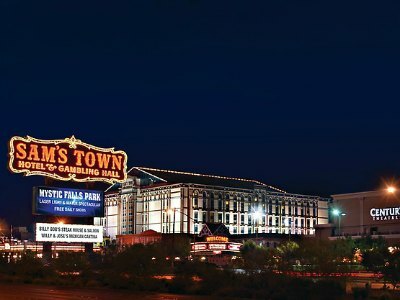 Review: The Sam's Town is a modern off Strip Las Vegas hotel located in the northwestern part of the city, 6 miles from the Strip and downtown. Rightfully named "town" the hotel offers everything so you don't even need to leave the hotel. But for those who do, they have regular shuttle services to the Strip and downtown, as well as to the airport. What makes the Sam's Town Hotel so special and great value is its secluded location and the availability of multiple amenities: swimming pool, Mystic Falls Indoor Park (great for families), a great casino with smoking and non-smoking rooms, bowling center, movie theater, show room that regularly hosts top-notch entertainment. The hotel is also surrounded by a golf field! The Sam's Town has 15 dining options! You can find there anything from buffet to sandwiches to ice cream and deli! 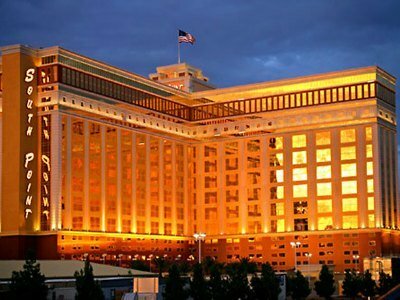 Review: The main feature of the Palace Station - off Strip Las Vegas hotel - is that it looks like a 19th century train station. Other than that, the hotel provides a great value for your money. Beware, however, that other than the room rates, they also charge resort fee for using their facilities, so be sure you use them if you opt for this hotel. There are two types of rooms - Courtyad rooms and Tower rooms, which are more expensive. Located 1 mile north from the Strip, the Palace Station provides a shuttle service to the Strip and the airport like most Las Vegas hotels off Strip. There are two swimming pools on site, casino, and a beautiful garden sundeck. There are plenty of activities nearby - anything from horse riding to helicopter tours to golf. Palace Station has great entertainment that includes live music and comedy. Their resident comedian is hilarious Loui Anderson - big baby boomer. For dining, there are multiple choices: Cabo offering Mexican menu, Feast Buffet serving world dishes for any taste, Food Express serving Chinese fishes, and more. Review: Elegant Westgate Las Vegas Resort & Casino, formerly known as LVH, is an iconic off Strip Las Vegas hotel with a rich history. Elvis Presley was an exclusive performer of LVH for eight years in a row with 837 sold-out shows. You can still listen to the King's immortal hits, performed by Trent Carlini, the tribute artist. The hotel's theatre also continues the line of world-class shows with headliners like Lisa Minelli and Glenn Campbell, followed with a dozen of other shows. 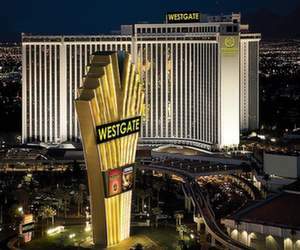 Located just one block away from the Strip, West Gate Las Vegas Resort & Casino is close enough to the Las Vegas Convention Center, and also has own Las Vegas Monorail station inside its building. The hotel offers plenty of services for every kind of visitor: relaxing hotel rooms and suites, exclusive restaurants with an exceptional service, and countless entertainment options. Sports fans worship the incredible Superbook - the world's largest Race & Sports Book with more than 350 cozy seats and numerous HD screens, completed with a bar and a snack restaurant. After a night at the luxury casino, guests can relax at the heated pool with their families, sipping a refreshing cocktail from the Ozen Bar & Lounge. Review: Recently built on the north of Las Vegas, relatively small Aliante Station Casino & Hotel managed to earn a reputation of a comfortable, relaxing and luxury resort. Amenity-laden suites are outfitted in contemporary and sophisticated style. Scattered and purposely dimmed spotlights add elegance to the thoroughly designed interior that contrasts white beds with dark wood furnishing. Look for clever package deals such as Family Retreat or Dinner & Movie! 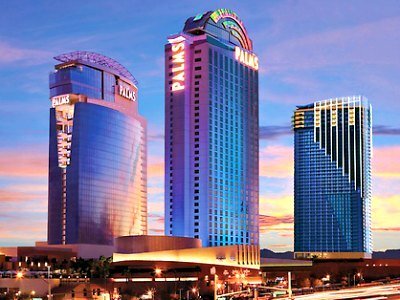 The fact that Aliante Station is an off Strip Las Vegas hotel is another good reason to trade the Strip's never-ending buzz for Aliante's privacy. Poker professionals can play poker 24/7 at eight dedicated tables with free coffee served. Bingo champions sharpen their pencils and fill a large 200 seat bingo room. More than 2000 video poker and slot machines, black jack, roulette, giant Race & Sports Book and other gambling favorites are all available at the casino. For relaxation after the night of exciting gambling, a picturesque luxury swimming pool with cabanas is the best option. Review: Family paradise with the adventurous scent of American West is the winning combination that attracts crowds to the Buffalo Bill's off Strip Las Vegas hotel for long weekends and vacations. Located in Primm, Nevada, this resort is a true oasis in the middle of the desert, just half an hour drive south from Las Vegas. It mainly draws visitors with its amusement park and gambling options. Buffalo Bill's hosts one of the world's tallest roller coasters - Desperado. Adrenaline hunters rush down from the height of 225 feet with a speed of 80 mph. Other devices include Turbo Drop with a free fall from 170 feet and the Adventure Canyon Log Flume for those who don't mind to get wet. Talking about water, the hotel's signature is the unique bison-shaped swimming pool. Gamblers head to the 46,000-square-foot casino with hundreds of slot machines, poker tables, dozens of table games and sports book. 1930's country aura embraces hotel's guests with warm-coloured room décor and countless references to the Old West. Shops, restaurants and theatre - everything reflects America's past and brings its spirit to the present. Review: When the Sin City's never-ending parties become annoying, Whiskey Pete's off Strip Las Vegas hotel is a perfect hideaway for a family vacation a short drive from Las Vegas. Escape into this charming castle-like resort with affordable, clean and comfortable rooms and tons of entertainment just around the corner! Free shuttle buses bring guests from the hotel to Primm Valley Resort and Buffalo Bill's Hotel and Casino, offering multiple choices of shopping, dining and attractions. Families with children adore the amusement park at Buffalo Bill's with its huge Desperado roller coaster. 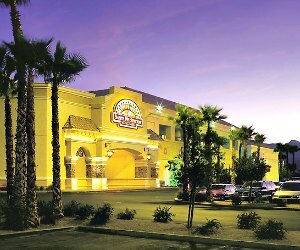 For pampering body treatments and relaxing massages guests head to the spa at Primm Valley Casino Resort. Golf champions can choose between two challenging layouts: the Desert Course or the Lakes Course. Middle-sized yet fully equipped casino also awaits for the fortune seekers. Stylish ladies will certainly enjoy shopping at the Fashion Outlets of Las Vegas, saving tens of dollars on top designer clothes. This list can be continued. Like a generous and welcoming oasis in the middle of the desert, Whiskey Pete's off Strip Las Vegas Hotel offers everything that thirsty for entertainment and carving for comfort travellers need. Silver Sevens has received its name after an intensive renovation in 2013. Former Terrible's Hotel & Casino, it continues to be a cheap Las Vegas hotel located off-Strip that remains close to the action. With a free shuttle to the McCarran International Airport and a short walk to the Bellagio Fountains, Silver Sevens is also very close to the Thomas & Mack Center, Hard Rock Hotel & Casino and University of Nevada. Rodeo Paradise Shopping Center is right across the street. Hotel's guestrooms are clean and spacious at the budget-friendly rate. The most relaxing suites overlook the courtyard with a crystal-clean pool hidden between lush palm trees. The main on-site attraction is the hotel's casino with lots of video poker and slot machines, table games, Race & Sports book and a bingo room. Make sure to check the combo promotions for the hotel, casino and dining! 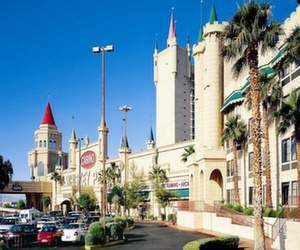 Texas Station is widely known as one of the favorite cheap Las Vegas hotels located off Strip thanks to its 91,000 sq. feet of gambling paradise including hundreds of the loosest slots in Vegas, video poker machines and table games. Lots of gaming promotions are offered every month like free bingo sessions. 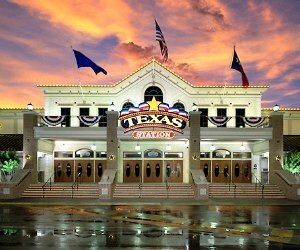 With the luxury casino that hits the spot, Texas Station is a beautifully designed entertainment center for the whole family fun. It has numerous dining options such as Austins Steakhouse, an outdoor pool, a video game arcade and a children-friendly 60-lane bowling center. For a nightlife, head to one of the alcohol bars or South Padre nightclub. Texas Station Hotel has 200 inexpensive guestrooms with the additional resort fee. The resort is a good deal for sport tourists, gambling fans and locals. 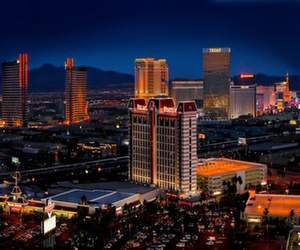 To taste the real nightlife at the Strip, you'll have to rent a car or order a cab, as the hotel is located few miles away from the central attractions. Texas Station resort has a reputation of an autonomic, self-sufficient resort for families with children or visiting relatives. Arizona Charlie's Boulder offers spacious hotels rooms, as well as space for RV's and is a favorite among local folks. Adjacent to the Arizona Charlie's Boulder hotel, Arizona Charlie's RV Park offers plenty of space for families with a motor home. The park is equipped with comfortable bathing and laundry facilities, sport equipment rentals and a large clubhouse. Additional amenities include free wireless Internet, propane service and security. Hotel's rooms are providing a lot more comfort at the affordable price. Standard amenities are complemented with a family-friendly outside pool and a hot tub. 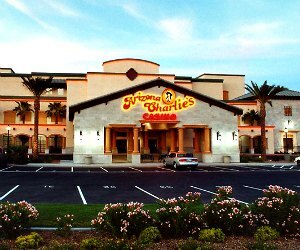 In addition to the numerous dining and shopping options, Arizona Charlie's Boulder Casino is the main attraction. 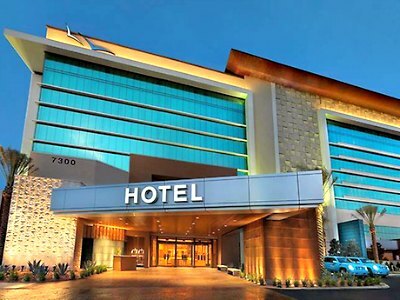 One of the best cheap Las Vegas hotels off-Strip with a casino favorite among locals, it is stuffed with slot machines, table games and action-filled screens of Race & Sports book. Expect lots of locals and smoke. Bingo fans can play nonstop at the casino's 24-hour Bingo Parlor. Enjoy the nightlife at the hotel's Elbow Greek Bar or Jake's Bar. If that's not enough, the resort is 20 minutes' drive from the Strip. Hooters, affordable off-Strip hotel exceeds the visitors' expectations with its luxury look, comfortable suites and on-site entertainment. 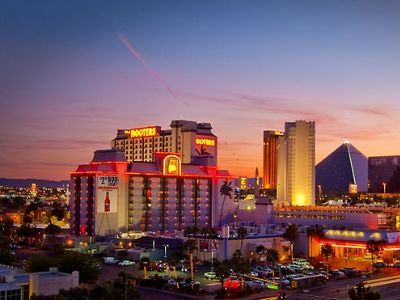 The location allows to enjoy the view of the Strip's best hotel towers from your room, and the Strip's attractions are at the walking distance. Las Vegas Monorail at the MGM Grand Hotel is just across the street! The hotel's rooms are pleasant and inspiring with light wooden décor and floral design. The family-friendly outdoor pool with waterfall echoes to the tropical mood of the suites, looking like a sparkling mirror with its swallow to deep isolated parts. Traditionally high-class Hooters restaurant is saturated with charming ladies and delicious meals. Hooters' eye-pleasing girls are also bringing cocktails at the 30,000 sq. 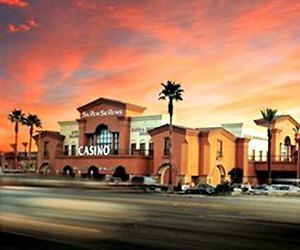 feet casino where you can play hundreds of slot machines, bet at the Race & Sports book or join a live poker room. The hotel's Night Owl Showroom features Kevin Lepine at the popular Hypnosis Unleashed show and the Purple Reign tribute show with a great impersonation of the Prince. 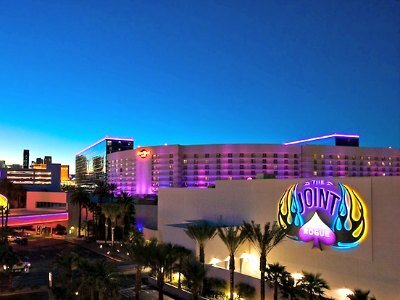 Cheap Las Vegas hotel only one block from the Strip with the full set of amenities and live entertainment, Hooters Casino Hotel also offers great deals like Flight + Hotel for even more savings! Four-starred South Point is one of the largest cheap off-Strip Las Vegas hotels, combining luxury resort's features with low room rates. 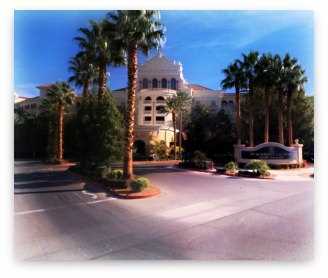 Located few miles south from the Strip, the hotel has more than 2,000 large suites with classic mansion-like interior. As the name suggests, South Point's main attractions are the 80,000 sq. feet casino and upscale Costa Del Sur Spa & Salon. The casino is huge with more than 2,400 slot and video poker machines, big Race & Sports book and a 600-seat Bingo room. Families enjoy the 64-lane bowling center and the Time-Out arcade room. For more entertainment, visit Showroom with ever-renewing performances or go to the South Point Equestrian Arena to watch amazing cowboy shows. The hotel has eight restaurants, a movie theater and lots of space for events, banquets or meetings. South Point outdoor pool with Jacuzzi is perfect for relaxing and tanning. For the body treatments, massages and other beauty services head to the Costa Del Sur Spa & Salon - a sophisticated spa with the cutting-edge 24-hour fitness room; hair, pedicure and make-up stations. South Point is one of the top Las Vegas destinations for families with children as it provides many entertainment options and affordable yet decent lodging. This welcoming resort is adored by state-to-state tourists and locals for a wonderful family vacation feel with a scent of nature. Busy families looking to unwind will instantly appreciate Silverton's wild nature inspired atmosphere. Resort's wood-and-plush rooms and suites breathe with comfort of the best mountain lodges. Hunters and fishermen spend hours at the hotel's Bass Pro Shop. One of the best free attractions in Vegas, Silverton Casino's huge saltwater aquarium features more than 4,000 exotic fish plus few "mermaids". Enjoy interactive fish feeding shows and then have a meal at the ocean-themed Mermaid Restaurant & Lounge! Relax at the refreshing hotel's pool before trying your luck at fully-equipped Silverton Casino, declared as one of the highest payout casinos in Vegas. For more action, the Strip is just a short drive away from this cheap Las Vegas hotel. Free shuttle service to both the Strip and the McCarran International airport heal the headache of taking a cab. 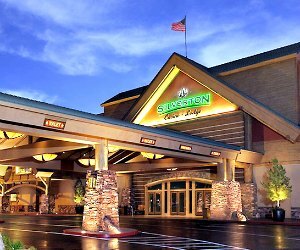 Silverton Hotel & Casino offers various deals, including race cars, concert and sports packages. 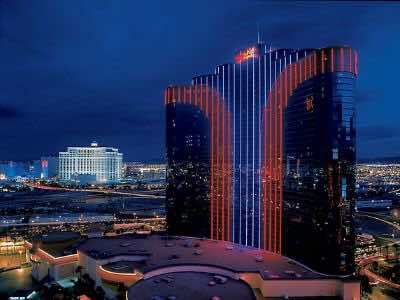 Westin is a family-oriented and pet-friendly four-starred cheap Las Vegas hotel near the Strip with affordable rates. Children under 18 stay free, and almost the whole hotel is non-smoking. Friendly high-class service and excellent amenities are this hotel's priorities. The rooms are quiet enough for this central location, allowing good sleep with soft Heavenly beds. Guests are pampered with various procedures at the large Hibiscus Spa, or enjoy daytime in fully served cabanas by the refreshing pool. Santa Fe Station has dozens of entertainment options to fit every preference and budget. One of the best locals casinos features 24-hour Poker room, more than 2,500 slot and video poker machines and a superb bingo room with 432 seats. Rock and country concerts take place at the neon-lit Chrome Showroom. Dancing and drinks make the floor shake at the Revolver Saloon and Dance Hall. After-dark entertainment continues at the playful 4949 Lounge and around-the-clock Iguana Bar. To combine pleasure, sport and a couple of drinks, visit the Bowling Bar in the 60-lane Bowling Center, or hang with friends at the Sports Bar. Families with children enjoy the hotel's movie theater, pool and indoor supervised Kids Quest child care. Have a perfect meal at one of the Santa Fe Station's restaurants offering fine to casual dining choices. Santa Fe Station is located in the north of Vegas, allowing shorter drive to the Mount Charleston and Red Rock Canyon. Smart choice for travelling families and a popular destination for locals, Santa Fe Station Hotel has 200 contemporary rooms with King beds and comfortable bathrooms. Visitors note that this cheap Las Vegas hotel and its maintenance are average, but still the low rates and numerous on-site attractions win the deal. The Gold Coast Hotel and Casino is a fancy off-Strip property with Victorian-style architecture, packed with entertainment options. The hotel's 711 guestrooms are recently renovated and have pleasant villa-like décor combining whites and earth tones. Located one mile from the Strip, Gold Coast offers a competitive choice of attractions. The most popular of them is a 120,000 sq. feet casino, equipped with the edge-cutting technologies like interactive betting terminals at the huge Race & Sports Book. In addition to more than 2,100 slot machines, tens of table games and 24-hour poker room, the casino features an impressive 720-seat Bingo room. Guests can enjoy first-class performances at the luxurious Gold Coast Showroom, or have a romantic meal at one of the fine Asian restaurants. The hotel's curved pool with Jacuzzi, modern fitness center and state-of-art 70-lane bowling center add some action to your vacation. Complimentary shuttle service is available to the Strip and to the resort's sister property The Orleans. Budget-friendly and respectable Gold Coast is a classy cheap Las Vegas hotel that delivers best value for less money. Review: JW Marriott Las Vegas golf resort attracts older crowd, which comes with less noise, less parties, and a very relaxing experience. Besides, JW Marriott is located only about 15 miles from the Strip, if you want to see the "real" Vegas. 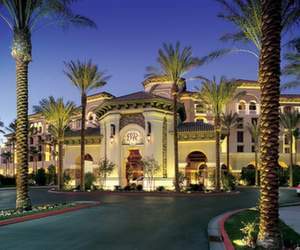 JW Marriott is located in a picturesque area in Summerlin, close to Las Vegas. It's surrounded by golf courses. Guests of JW Marriott have access to TPC Summerlin - Tournament Players Club that is a private golf club. TPC in Summerlin was designed by Bobby Weed and is considered one of the most prestigious golf clubs in the USA, and in 2006 it was named "No 1 private Golf Club in Las Vegas" by Nevada Business Magazine. There is also another golf course near the hotel - Angel Park Golf Club, where the concierge of the hotel can schedule tee times. If you are not looking for fun at the Strip, JW Marriott is one of the best Las Vegas golf resorts. Apart from great Las Vegas golf vacations, the resort offers 11 restaurants and bars with menus ranging from casual to Mediterranean to Italian and Japanese. The resort also has Aquae Sulis Spa, inspired by ancient Roman baths, featuring 36 rooms and offering a full range of relaxing spa treatments. 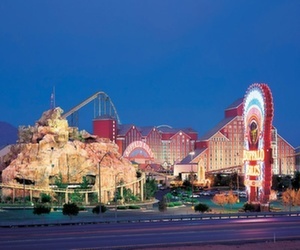 Review: Primm Valley Resort & Casino is a very affordable hotel that is part of the Primm Valley Resorts network made up of three hotels, sharing most of their amenities and easily connected with free shuttle buses and a monorail - Whiskey Pete's and Buffalo Bill's. The main attraction of the resort is Primm Valley Golf Club - gorgeous and lush, it was designed by Tom Fazio. The golf club consists of 2 courses - Desert Course and Lakes Course. Of the two, Lakes course is considered more beautiful, but Desert Course if more challenging. The Golf Club at the Primm Valley Resorts is a fun stop for golfers driving from California, because it's located right on Nevada/California border, with the golf course actually located in Nipton, California. While you don't have to stay at the resort to play golf at the Golf Club, the Primm Valley Resort offers incredible golf vacations. Note that the resort is located quite far away from Las Vegas. The Primm Valley is an off Strip Las Vegas hotel with it's own spa, casino, and shares many restaurants with it's 2 other properties. Which is another reason to stop on the way from California!